More and more brands are inclined towards incorporating ashwagandha into there finished products to take advantage of its ability to support the body and mind, boiling down to the right supplier that can deliver a consistent, quality ingredient can be a challenge. There are many important factors to consider, from the clinical science on the ingredient to supply chain traceability and quality control. Take a look at few of these considerations and how KSM-66 Ashwagandha meets the standards. 1. 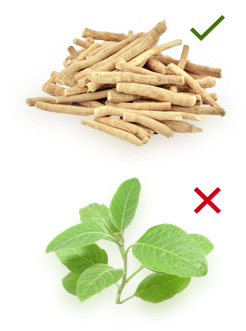 Make sure that your ashwagandha extract is drawn from roots alone and that leaf components are not added. There are some ashwagandha makers who make the extract using the plant’s leaves instead of just the root. However, KSM-66 uses ONLY the roots with no addition of leaves. This is because, for maximum clinical effectiveness, the ashwagandha extract is conceptualized primarily as a root extract, not only in ayurveda textbooks, but also in the standard references like the Indian, the British and the U.S. Pharmacopeias (their specifications are based entirely on the root, the leaf appears nowhere). There is a large number of studies documented in PubMed and conducted by universities and research hospitals, virtually all of which use root-only extracts and no leaves. While there are numerous human clinical studies using the root extract, pretty much the only clinical evidence for a root+leaf extract is from research sponsored by such extracts’ manufacturers themselves. Therefore, KSM-66’s approach of using only roots is on vastly better scientific and historical foundation than the approach of these other ashwagandha extract makers who use leaves. 2. Make sure that you assess the concentration of cyto-toxic Withaferin A. Not all withanolides are beneficial. Withaferin A is one withanolide which is cytotoxic, as has been established in multiple scientific studies. So, it is undesirable to have Withaferin A in an ashwagandha extract when the intended use is for classical applications like building anti-stress ability, energy, cognition and immunity. Some ashwagandha extracts have high levels of Withaferin A because the manufacturers use ashwagandha leaves. Using leaves spikes up the overall withanolide content, but it also brings in the undesirable withanolide ‘Withaferin A’. KSM-66 consists of negligible levels of Withaferin A, making it very safe for human consumption. 3. Make sure that withanolide content is optimum and that the content assessment is by HPLC only. While selecting an ashwagandha extract, please make sure that the withanolide content is neither too high nor too low. Having higher percentage of withanolides (eg: more than 25%) is not desirable as it would make the extract pharmaceutical drug-like with more emphasis on single molecules. Having too low percentage of withanolides (eg: less than 2.5%) is also not desirable as it would require a higher dosage for consumption. KSM-66 Ashwagandha’s unique extraction process yields optimum percentage of withanolides, retaining the other important bioactives of the plant, which are required for the efficacy of the herb. The vast majority of manufacturers across the world estimate withanolide content by gravimetric analysis, which does not provide accurate results. Unfortunately, gravimetric analysis often overestimates withanolide content by a factor of 2.5 to 3! This is because gravimetry does not adequately discriminate between withanolides and some other constituents, thereby bundling withanolides with other compounds and over-assessing the extent of withanolides. Furthermore, gravimetric analysis is idiosyncratic and shows too much inter-batch and intra-batch variation. In contrast, the HPLC method of withanolide assessment operates near the molecular level and is much more discriminating and accurate. 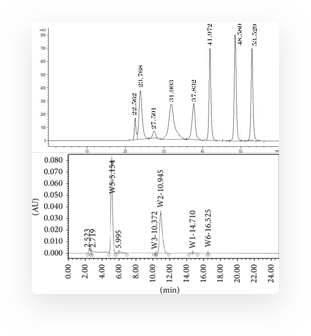 KSM-66 withanolide content is measured by HPLC and is found to be of >5% concentration. As an aside, when measured by gravimetry, the concentration is found to be in the 8% to 15% range. 4. Make sure that the clinical studies are published in high quality, high creditbility outlets like pubmed-Indexed journals. 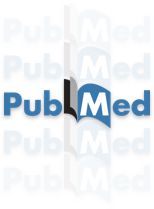 PubMed is an index, maintained by the U. S. Government’s National Library of Medicine, of articles published in what academics consider to be high-quality biomedical journals. Journals not indexed in PubMed are considered to be of a distinctly lower tier than Pubmed-indexed journals. Ixoreal is the industry leader in clinical trials investigating the effectiveness of ashwagandha, and KSM-66 is the ashwagandha extract with the most extensive set of research studies. KSM-66’s research publications are in PubMed-indexed journals. Most other ashwagandha makers’ clinical trials are not published in PubMed journals. Also noteworthy is that KSM-66’s clinical trials are conducted by well-established physicians and scientists with strong publication records. 5. If your end-product is for wide appeal, make sure that the clinical trials on your ashwagandha extract use normal, healthy populations. Some ashwagandha makers’ clinical studies try to show the effectiveness of their ashwagandha by demonstrating improvement in clinically compromised populations or otherwise less than fully healthy populations. However, if your finished product is targeted toward normal healthy populations, this is very problematic because clinically compromised populations are systematically different from normal healthy populations and, therefore, demonstrations of improvement in clinically compromised populations may not hold true for normal healthy populations. Broadly speaking, because of the physiological law of diminishing marginal improvements, it is easier for a drug or ingredient to achieve improvements in clinically compromised populations than in normal healthy applications: for example, it is relatively easy for an obese person of weight 300 pounds to lose 5 pounds than it is for a healthy person of weight 165 lbs to lose 5 pounds. The makers of KSM-66 have taken great pains to ensure that KSM-66’s clinical studies are all on normal healthy populations having no pre-existing clinically adverse conditions. Recruiting people from normal healthy populations is frequently difficult because they are less interested in participating in clinical studies. However, for the makers of KSM-66, it is critically important that the clinical trials be on normal healthy people because most of KSM-66 customers target their end-products at normal healthy people who want to develop some extra function or strength. Therefore, it is important to have efficacy data available for those kinds of normal healthy people. 6. Make sure your ashwagandha extract is a full-spectrum extract. Botanicals are complex substances with many constituents in them. With many botanicals, modern research has proven clinically beneficial effects but oftentimes has not been able to definitively identify which specific constituents in the botanicals cause the effects. Many herbalists and scientists believe that, with Ashwagandha and several other herbs, it is not just one or two constituents that cause the clinical effects, but rather it is the combination and synergy of several constituents that gives the clinical effects. For this reason, it is important to use a “full spectrum” extract. A “full-spectrum” extract is an extract which maintains the balance of the various constituents as in the original herb, without over-representing any one constituent like, say, the withanolides. 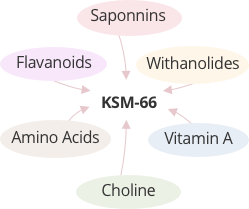 KSM-66 is a full spectrum extract different from other hydro-alcoholic extracts because its innovative extraction process does not upset the delicate balance of various constituents found in crude ashwagandha root; rather, it retains and potentiates the synergism in the whole root.